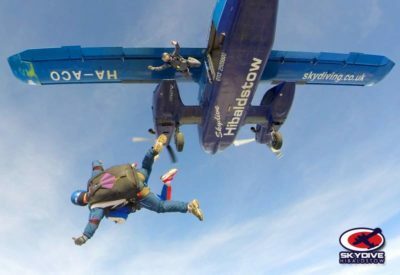 For some, skydiving does not come easy. It takes a lot of courage and persistence. 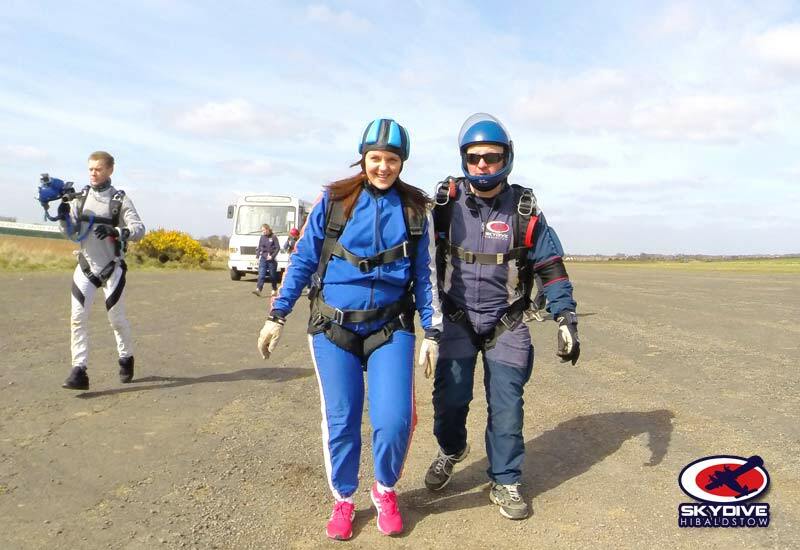 But when a person does make their first tandem skydive and when it is for charity, the sense of achievement and endeavour is amazing. It’s a real ‘life achievement’. 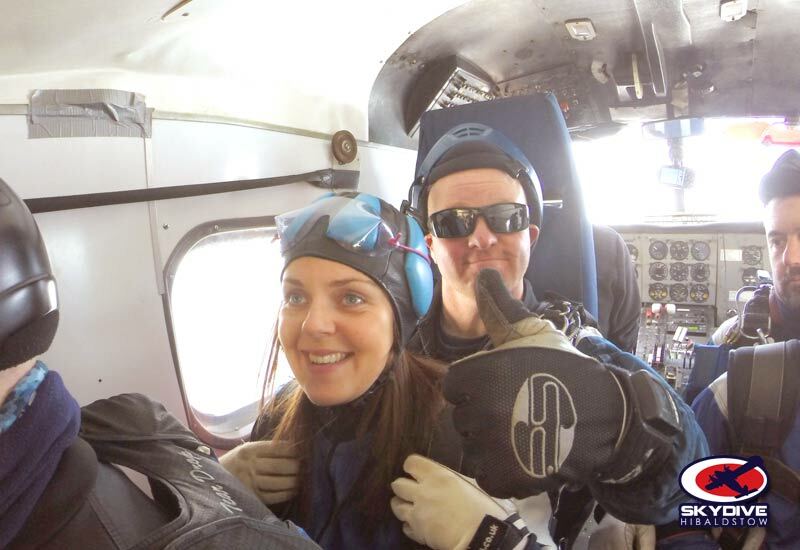 This is the story of Tara Sherwood and her first tandem skydive. How much did you raise and how many were there in your group? I have currently raised £1385 but £1400 is in touching distance as my grandparents are yet to donate. 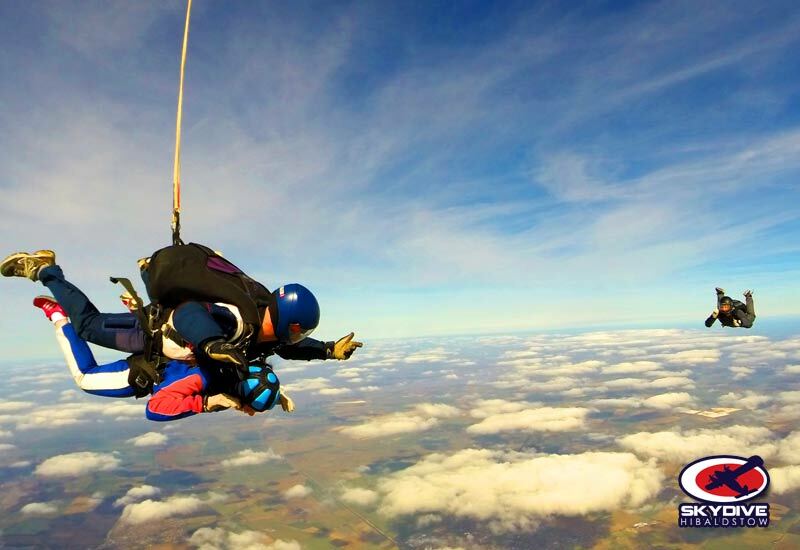 I was originally booked to skydive 7th March with the Overgate Hospice Team. 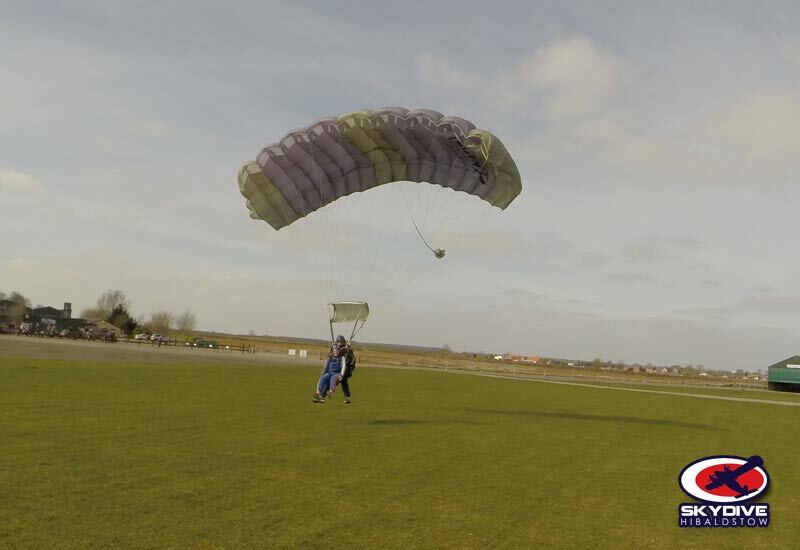 We had some bad weather initially, so it was 3rd time lucky for me when the chairty tandem skydive finally happened. Is this your first jump and when was it? Yes it was my first jump and we had perfect weather conditions. I had turned into a keen weather woman in the run up to it, obsessed with wind and cloud. As soon as I arrived at the dropzone I knew there were going up as people were stood about looking at the sky. Eeeek. 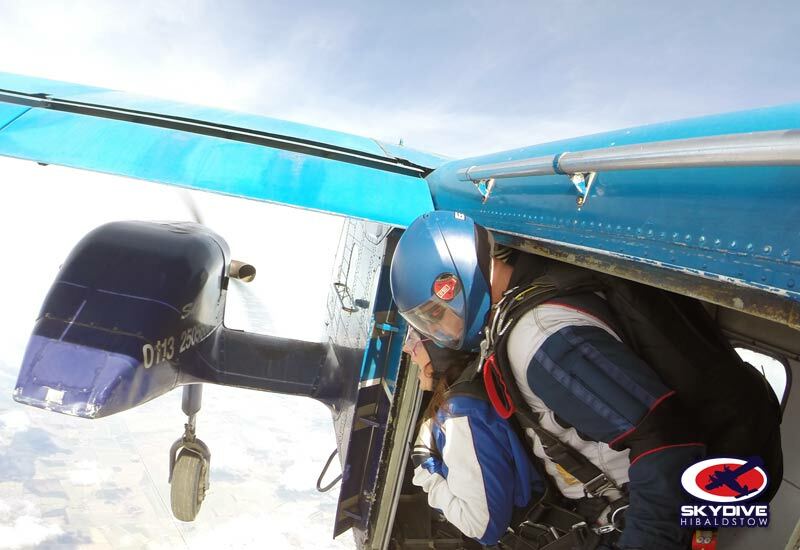 What made you decide to do a charity tandem jump over something else like a sponsored run for example? 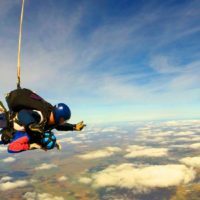 In the past I have done sponsored walks and runs, so a skydive was something I thought about doing last year but had missed the charity deadline. When the next flyer came through and I saw it was within the next 4 weeks, I jumped at the opportunity. I like rollercoasters and I’m not afraid of heights, so knew it was something I was capable of doing and I kept thinking “imagine the sense of achievement! Imagine how I’ll feel when my feet are back on the floor. Imagine, imagine”. 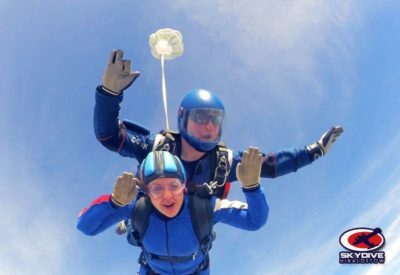 What better way to tick something off your bucket list while raising money for charity. It was such an amazing opportunity to be given, I wasn’t going to let it pass. Do you have a connection with Overgate Hospice? I don’t have a personal direct connection with Overgate Hospice, but it is the only hospice in Calderdale and it is close by from home. I know how important hospices are and it’s a charity I have supported for some time. The place and everyone involved with the hospice including patients, are amazing. What were your fears before arriving at the dropzone? Oh I had many many fears before arriving at the drop zone. What didn’t worry me! I was worried I would faint or have a heart attack. What if something happened. How would I possibly jump out of the plane, its not a natural thing to do. What if I closed my eyes and missed it all. What if, what if. However, thanks to the professionalism of the staff, I don’t even remember my nerves until I was at the door. Excitement yes. Then I screamed until the wind took my breath away. I felt like I was in the RAF all bundled up waiting for the red light. What was the training like and did it prepare you for the jump? The training was fantastic, but I don’t think anything or anyone can prepare you for the real thing. It was great to know what we would be wearing, what to expect, what to do and when, what freefall body positions to adopt, etc. It was done with humour which took the intensity away from it. The training took about 20/30 mins which I think were the most exciting minutes of my life, in addition to the jump itself. 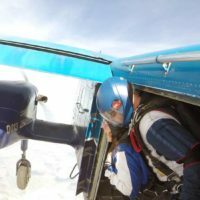 For those that have never experienced freefall before, what was it like? 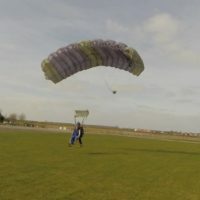 Regarding the freefall, I thought it would be like floating or flying but as soon as I left the aircraft I felt like I was falling until I got use to the sensation. Then it was like flying in extremely strong winds. It is not easy to describe, but its absolutely amazing! I kept telling myself it would be like when on holiday and you dip your toes in the pool and its freezing cold, that initial full body plunge into the pool. Scary and hesitant for the first moments. 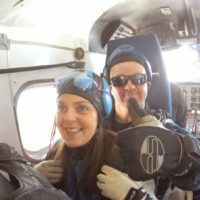 Do you have any advice for others thinking of their own skydiving adventure? My advice to others would be – DO IT! Don’t give it a 2nd thought. I felt on top of the world and couldn’t stop smiling. Its such a huge achievement, whether that be personal, within a team or for a charity and I will definitely do it again. I think it will become a new hobby. It is truly was amazing. The staff were even more amazing. I don’t think people realise how much time, safety, effort and preparation goes into it. My friend said she wouldn’t do it, but after seeing what’s involved, she is now considering it. I am in awe of it.